Working against Discrimination on the basis of work and descent has been the one thing I have been grappling with during the 37 years of my life as a Jesuit. It all started when I chose to study Rural Development Science instead of Botany even while I was a candidate to the society of Jesus. My desire to work among the discriminated people became pronounced during my regency at IDEAS (Institute for Development Education Action and Studies), the first of the social action centres of The Jesuit Madurai province, founded by Fr. Aloysius Irudayam SJ. He drew scores of Jesuits into social action including me by his example and inspiration. In 1993 November I was ordained a priest. Soon after I had an invitation to deliver a homily in a feast day mass in a small chapel in a remote village in Tamil Nadu. We were four priests celebrating the mass. Even before we vested for the mass, the elders of the village entreated that the priests should have a meal soon after the mass. The mass was over in an hour. As the people were milling around the statue of the saint in the chapel, I heard the car of the Vicar Forane leave the campus, and it was followed by the motorcycle of the parish priest and the third priest who concelebrated left with the parish priest. The elders came and almost dragged me to a house where they had prepared a meal and had set a table for all the four priests. I was the only one left behind. 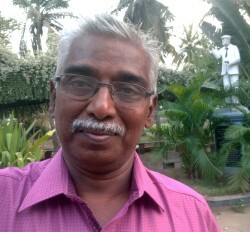 That day I came to know that Catholic priests belonging to other castes discriminate the Catholic Arunthathiyar (a social group that is forced to work with leather as well as forced to take up sanitary work in the villages and towns) and consider them polluting and wouldn't eat or drink anything given by them. It was my first encounter with this type of discrimination. I saw the priests running away from the church campus before the people could offer them something to eat. Then onwards, I have made it a point that every day I walk into some Dalit Village or the other and accept their hospitality. Sit on anything they offer, a mat, a bedspread, a chair. Drink and eat anything and everything that they offer. The situation in India is like Apartheid in South Africa. The perpetrators are the social group called Brahmins who form only 3 percent of the population of India. And everybody else suffer graded untouchability. Everybody else in India is discriminated on the basis of work and descent. The perpetrators have insidiously hierarchized untouchability. And every social group is fighting every other social group. And movements of social transformation stumble. The Discrimination on the basis of work and descent is rampant in the Catholic Church too. I have been working predominantly with the leather workers and sanitary workers as well as the washer men communities. One of the great Jesuits, Fr. Robert De Nobili SJ, who worked in India managed to preach the gospel to the indigenous people through his ingenuity of using inculturation, had to fight this discrimination on the basis of work and descent. He brought various groups of people into his church and made them participate in the same Eucharistic Celebration and share from the same Chalice. But he had to compromise! The people would not sit at the same level in the Church. The floor of the Church was to be at least an inch lower where the people considered lower castes are seated. In some places a barricade was erected right in the middle of the Church running from the entrance to the altar. Three hundred years had to pass before something can be attempted to make things right. Bishop John Peter Leonard of the Society of Jesus fought against all these practices and broke down the barricades. And several priests stood with him. And I was inspired by their example, and I try to contribute towards fighting against this insanity in my own way: Eating and Drinking whatever the Dalit people offer. Eradication of caste is the only thing that can save the people from perpetrating this heinous crime of discrimination based on their work and descent. The emergence of the right wing political parties in India and their capturing political power makes our work all the more difficult. I have been instrumental in bringing up the social action centres AHAL and AMUTHU where about seven Jesuits are working among the discriminated social group called Arunthathiyars (leather and sanitary workers).